For the last several years, I've started off the late summer thinking about my plans to complete 5BDXCC. This has meant figuring how who to make more DX contacts on 80m, whether that meant improving antennas or just being on the air more. But, this June, I managed to wrangle enough confirmations to qualify. I'll likely submit these in November. As that time of the season rolls around again, I have to think - what's next? What comes after 5BDXCC? It's a good question. I still have a few other bands to add. On 17m, I have 87/87 confirmations, so that's likely next. It will be easier now that I've identified the problem with my WARC dipole. ON 12m, I have 73/73 confirmations is not that far behind, although old Sol is not likely to be active enough to sustain much propagation on that band for a few years. 160m seems less likely, where I have 42/41 confirmations. Given how hard 80m was, it may take quite a while to add many more entities there. The DXCC challenge is still unclaimed. I have 835 current credits, and my unapplied LoTW confirmations will bring me up to 1125, if I applied them all. Plus at least five more QSLs I'll submit this year could get me all the way to 1130. I've decided a couple of years ago not to push for this too early. The 80m DXCC submission this year, plus all the band endorsements should get me over 950 credits. I'll make it over the 1000 credit requirement as soon as I complete another band. And, of course, there's the DXCC Honor Roll. At the moment, I have 259 current confirmations, which puts be 80 away from the 339 total. And 71 away from the 330 required to make Honor Roll. That may take quiet a while. I have two cards that I'll submit this year, and there's a dozen more entities I've worked that I need to obtain confirmations from. Naturally, some of these remaining entities are increasingly rare. The good news is there are several exciting DXpeditions this year. I'll have to make plans to work them when I can. So, yeah, still a lot of challenges left in DXCC. Yours truly on the tower. 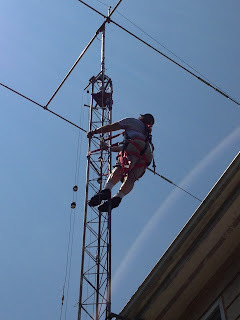 When I moved back from Floyd County a couple of years ago, I did a tower inspection. When I got to the top section joint, about 10 feet above the roofline, I lost my nerve. I checked the bolts, then came slowly down the tower. I haven't climbed since. Until today. I really had to. All the antennas on the top of the tower show signs of being messed up. Mission today was the WARC dipole. While still resonant on 12m, 17m showed no match, and 30m was way out of band. 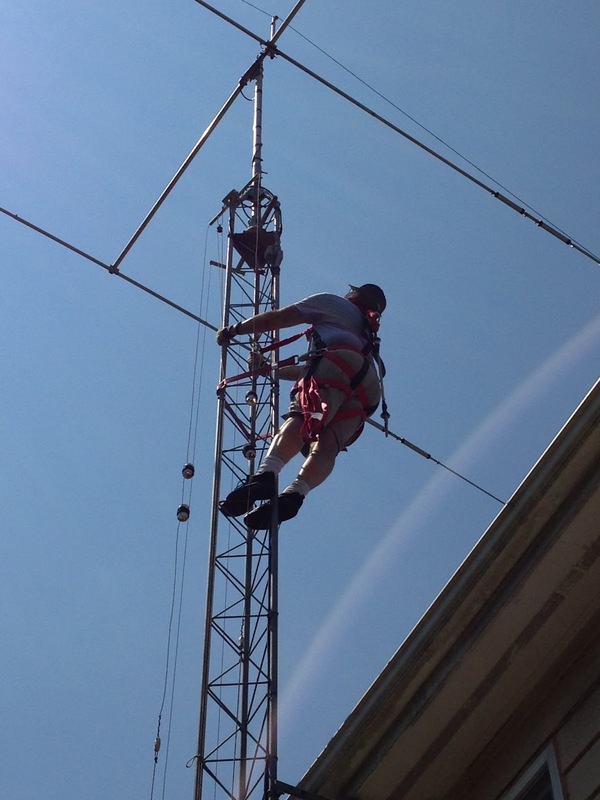 I took the ends of the dipole loose, you can see two of the traps around my foot level on the tower. Then the climb to the 44 foot level of the tower. The center of the dipole is a NEMA box U-bolted to the tower leg. Being up there is a little unnerving at first. You try to stay as still as possible, because each move causes the tower to sway. Of course, as soon as I got up there, I find I don't have a screwdriver. This is why you always use a ground crew. My daughter Lauren did an excellent job in this department. With the lid to the NEMA box off, took off the U-bolt, and lowered the dipole to the bottom of the tower. Once back on the ground, a quick inspection showed what was wrong. One of the 17m traps had a clear open, and it wasn't something that was easily fixed. After 12 years on the tower, the shield braid from the trap coax had disintegrated. The trap needs to be rebuilt. It's companion doesn't look much better. In the interest of keeping them symmetrical, I decided to rebuild both the 17m traps. The 12m traps are a couple of years younger, and look to be in good shape. After I get the traps rebuilt, it will be back up the tower to re-install. And then I need to lower the A3S down so I can check out the driven element -- figure out why I've lost resonance on 15m and 40m is so messed up.